Galleri Brandstrup is delighted to announce “Babel”, an exhibition of all new work by Lars Elling. The artist has created a series of new works which were painted in Oslo and in Cape Town. 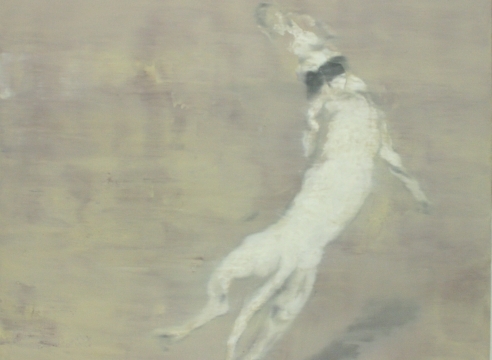 They are all made in egg oil tempera, which has become Elling’s preferred technique and one of his trademarks over the last years. “In the Bible, after the great flood had passed, a small part of human life was left alive. Now living in the dessert, they decided to build a great tower to honor their god that had spared them. God, on his side, found the building arrogant and haughty, and sabotaged the building by giving the humans separate languages. The time of misunderstandings begun. A small hill close by my studio in South-Africa reminds me of Brueghel’s tower of babel. Or at least something that could be of resembles to its ruins. I have been working with interpersonal relations between humans, psychological imbalance, power and powerlessness in my art for over 20 years. The family as a stage of our first private theater play where we are presented for these subjects early on in life. There is language confusion in the small, inner and the big, outside world is just as real today as it was with the workers building the tower of Babel. When the word no longer communicate, image is important, maybe crucial.